My pet peeve: having to read through paragraphs of someone’s personal reflections and 20 full size images (lovely as they may be) before getting to the recipe when all I want is the recipe. So, without further ado, here’s the recipe. If you’re interested in hearing the thoughts about what God has been teaching me through banana bread lately, read on past the recipe. My best banana bread, adapted from my mom’s trusty recipe, and permanently doubled. bake at 350 for 45 - 55 minutes in greased bread pans, until sharp knife comes out clean; makes 2 loaves. God makes wonderful things out of ugly things, something out of nothing even. Really, how can those nasty brown bananas and sour milk make something that tastes so good? How can something that would be thrown away in a heartbeat become such a surprising gift? Baking banana bread is a tiny act that aligns my heart with this truth, that God is good and never gives up on our rottenness. We don’t have to waste so much. I hate throwing food away, and this recipe is perfect for using up those half-eaten bananas I find around the house and old sippy cups of milk from the back of the fridge. (Gross I know, see point number one.) But really, stop throwing so much away. I am enough. A few months ago, we had a gentleman come from out of town to speak at our mission school. It had been a crazy week already and I was caught a little of guard when he came through the door. By the grace of God, I had banana bread in the oven, which I had been meaning to make for days and hadn’t made in months, which also just so happened to be this man’s most favorite thing. I made it again the day he left, and as he prayed over our family, it was so clear to me that my role as a mom and occasional banana bread-maker is having kingdom impact, even on the days I feel as though I am spinning my wheels and not at all “doing” enough. Giving is good. Things like baking banana bread are never on the very top of my priority list, so it often takes quite a few days for good intentions to turn into good bread. For this reason, I then tend to have a hard time sharing. I worked for it, I shouldn’t have to share, right? Terrible, I know. In this season, I am learning that the best thing I can do with that extra loaf of banana bread is to give it away and I’m surprised by the joy that brings. 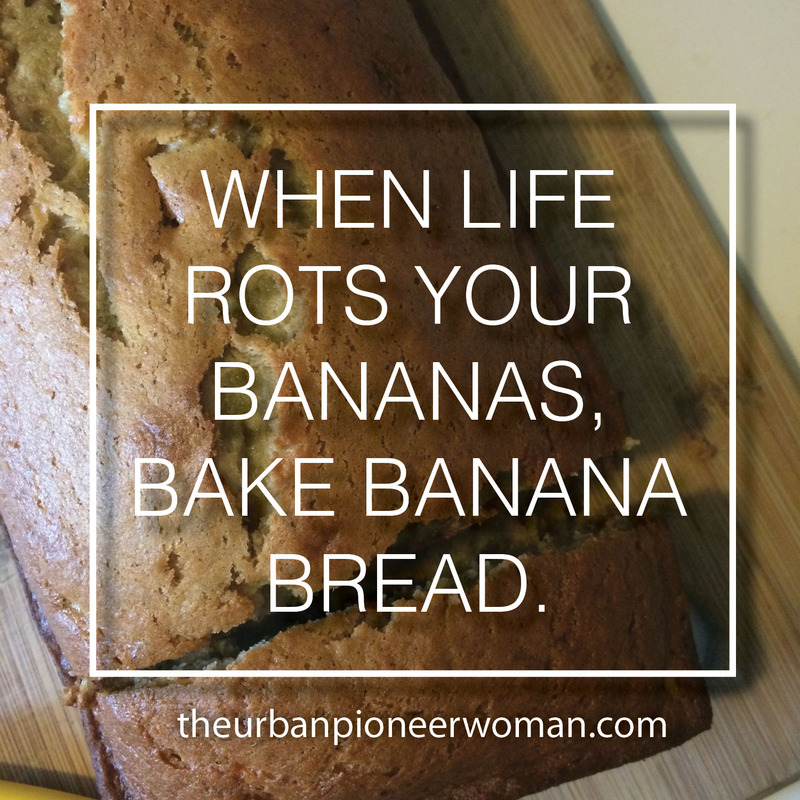 So I challenge myself and I challenge us all, when life rots our bananas, make banana bread. Try the recipe above and let me know what you think, and remember – the recipe is doubled so you can feel good about giving that second loaf away.